India’s biggest international travel show, One World Travel Mart (OTM) held at Pragati Maidan with the promise of “Around the World in 3 Days”. In the event over 350 exhibitors and participants from 27 countries and 22 states were participated. The three days travel show with clear focus on outbound travel provides an annual opportunity for organizations from around the world to showcase their products to a large cross-section of travel trade industry and consumers, in all major outbound markets in India. This year OTM had having large participation from China, Sri Lanka, and Turkey, the partner countries. Philippines, Zimbabwe and Syria are also making sizable presence as feature countries. The other participating countries include Argentina, Brazil, Chile, China, Colombia, Dubai, Ecuador, Nepal, Latvia, India, Mexico, Macau, Malaysia, Maldives, Peru, Seychelles, Taiwan, Turkey, Thailand, Tanzania, USA, and Uzbekistan. From India, partner states like Jammu and Kashmir, Himachal Pradesh, Gujarat, Andhra Pradesh, Rajasthan, Karnataka and Kerala participated with large private delegations. Jharkhand and Punjab were the feature states , while Delhi was the host state. 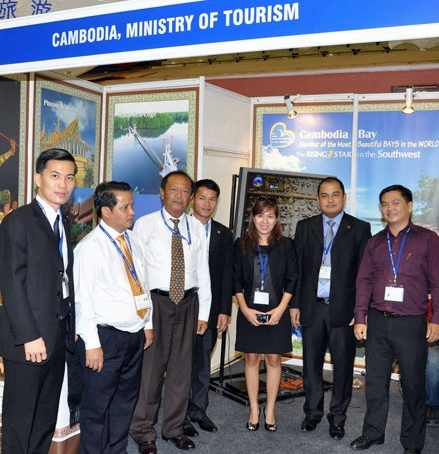 The key players in the tourism industry including national and state tourism boards, theme parks and attractions, hotels and resorts, travel agents, tour operators, online travel agencies, airlines, cruise-lines, railways, ground transportation agencies, MICE operators, travel-related financial products, and travel media were marking their presence. OTM was supported by the Ministry of Tourism, Government of India, the Host State – Delhi, as well as travel industry bodies like Pacific Asia Travel Association (PATA), Indian Association of Tour Operators (IATO), Outbound Tour Operators Association of India (OTOAI), Association of Domestic Tour Operators (ADTOI) etc. Mr.Santosh Goenka informed Dwarka Parichay that Fairfest Media Ltd. pioneered TTF as India’s exclusive Travel Mart way back in 1989. Today it is the oldest and the biggest travel show network, representing the maximum number of locations, participants and visitors. Over the years an exclusive International Section, branded as OTM – Outbound Travel Mart, was introduced, to address the growing numbers of international participation. DDA HOUSING SCAM – WHEN THE CHECKIING OF SOFTWARE WILL BE OVER?